As someone who can’t swim and is actually terrified at the thoughts of submerging myself underwater, I’m a sheer sucker for all types of waterfronts dwellings. Something about Venice has always been captivating to me and I’ve always thought places like Positano were as close to dreamy as possible. Maybe it’s because I grew up in a fishing village south of Vietnam and something about being able to fall asleep to the ocean’s waves grew endearing even when the floods came often. As Japan becomes a country that I frequent more and more in the past couple of years, I’ve started to appreciate this coastal city as well. As much as I can ooh and ahh at the pretty Japanese gardens and bamboo grove, I’ve been looking for a waterfront oasis like this place for a while. I came across an article on Ine no Funaya during last year’s trip to Kyoto (which is technically this year since it was between December/January) and wanted to see it for myself since. It’s rare to find a place that isn’t filled with tourists and flocks of people with self-sticks that often hits the back of your head or makes a cameo in all of your photos. 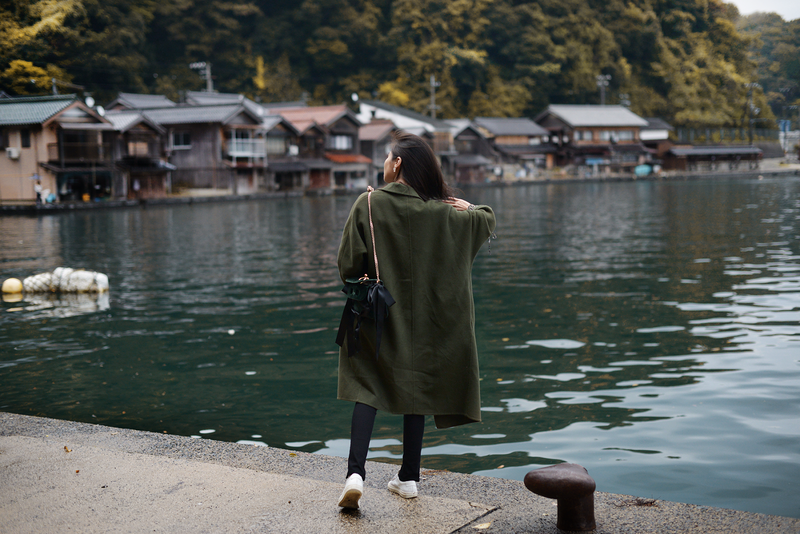 But hidden gem and locally authentic aside - I was just really happy to be by the sea again for once and breathing in the fresh air of Kyoto both literally and figuratively.